Cast aside by her secret husband after his transformation, Evil-Lyn® sent their infant son into the future and plotted to overthrow Skeletor® by releasing his enemies from their dimensional prisons. In a series of miscalculations, she helped free the Snake Men™, Hordak® and Gygor™ — increasing her adversaries threefold! After Randor and Miro returned from Despondos™, the Three Towers rose and Evil-Lyn® found herself again allied with Skeletor® during the Second Ultimate Battleground. At the end, defeated and stripped of her powers by the new Sorceress® of Grayskull™, Evil-Lyn® used the Cosmic Key™ and the Power of Central Tower to return to the future to find a new life with her long lost child — The Son of Skeletor®! Quite a bit of new information in this bio. First, we learn for certain that Evil-lyn actually married Skeletor at some point, albeit secretly, and they even had a kid. I’m a little unclear on how the events proceeded, but my guess is Evil-lyn got pregnant by Keldor, had the child secretly (probably after Keldor was transformed into Skeletor), sent it into the future (probably with the aid of her father, the Faceless One), then remained an Evil Warrior and began unleashing all of Skeletor’s enemies into the world, each of which backfires on her. The “Son of Skeletor” plot thread may be a reference to “He-Ro, Son of He-Man,” a rejected 1996 cartoon pitch by Lou Scheimer Productions to bring back the He-Man franchise. The cartoon would have featured a teenager named Dare, a ward of King Adam, who could turn into the He-Man-like “He-Ro” using the Power Sword. If you skim through the pitch’s bible (via the link above), you’ll see there’s a lot of talk about the mystery of Dare’s parents. However, Mattel’s Scott Neitlich confirmed that Dare is not the son of Skeletor – which makes sense, since that would have been far too interesting a plot point for these bios. If Dare was the son, he would have to have green skin! so… why was gygor one of skeletor's enemies? he was trapped back when skeletor was keldor, and we have ZERO mention of him interacting at that point (and for the "releasing his enemies" statement to be true, wouldn't that necessitate a pre-existing relationship?) the gygor bio states that the two were contemporaries, but in one way mentions that they were allies. not to mention, the mystic wall never gets a location stated, but it's worth note that, according to their derfy map, the vine jungle and snake mountain are on different continents, and whomever was willing to make the swim to see the other guy was going to have to cross anwat gar where i'm sure the martial arts masters were totally cool w/ these evil dudes popping ashore for a rest and maybe a light nosh. A bunch of guns stacked together, Big Van Vader, one of those roaches from the exterminator commercials, Ganon, and Joe Biden. 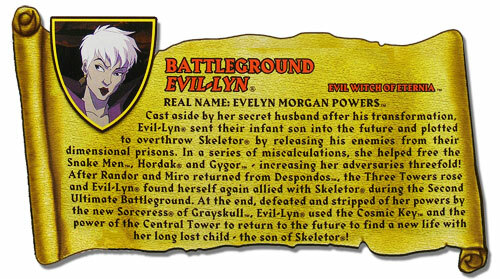 Gygor's bio does say Evil-lyn released him in an attempt to bolster Skeletor's forces – so how releasing him was a "miscalculation" on Evil-lyn's part is unclear. More related to the bio, you think EL would have learned her lesson after the second, if not first time. To be fair, having Dare be Skeletor's kid could also be construed as being a little too Star Wars, though it's not like that kind of thing hadn't been done before 1981. My brain can't get past Skeletor and baby-making. This is the same reason why I claw at my eyes any time Goofy's son appears in something Disney-related. Hi. This blog is really great. I found your blog while searching Google. It gives Lots of information which can be helpful for others. Looking forward for more content and keep updating the blog .